From its medieval market town roots to its growth during the Industrial Revolution, Stratford-Upon-Avon’s industrial past has played an important role in the town’s development. Nowadays, industry has taken a backseat, but it is a lively town with an active retail and tourism presence. The large number of shops and homes across the town means crime is unavoidable. 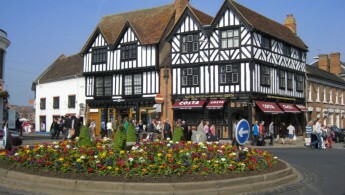 Between Jan – Dec 2015, there were 238 recorded counts of shoplifting, while graffiti, property damage and other forms of anti-social behaviour accounted for 839 incidents, making security in Stratford-Upon-Avon a concern for both business owners and homeowners. We have worked with business owners and residents in and around Stratford-Upon-Avon for over 30 years to secure your shops and homes against criminal activity. Using a range of security systems and our expert services, we help to protect what matters most to you, whether this is your family or financial businesses assets.